I want to extend a huge thank you to all of the volunteers, students, and families who came to Saturday’s Cash for College workshop at Belmont High School, including volunteers from 826LA and Cal State LA. The workshop was a huge success, and it was because of all of you! More than 50 students showed up to get assistance with completing their federal student financial aid applications. Two lucky students who attended the event will also be randomly selected for $1,000 Cash for College scholarships. On Friday and Saturday, March 4 and 5, Outfest will present the Fusion Film Festival, featuring films of interest to LGBT people of color. 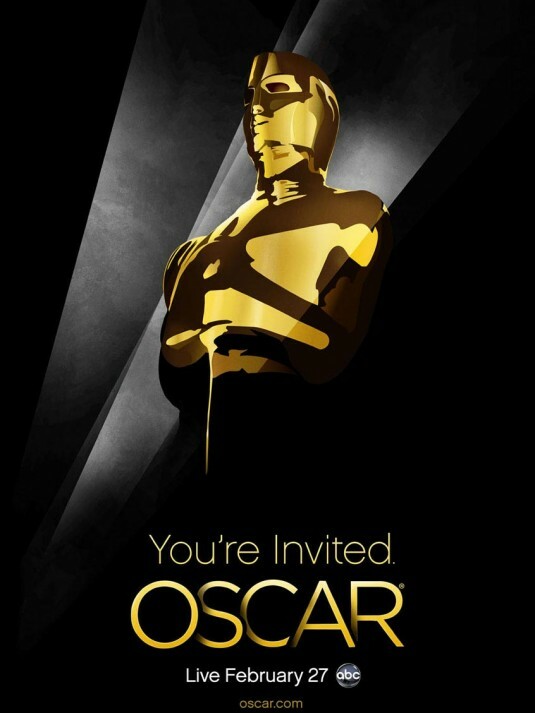 The screenings will take place at the Egyptian Theatre (6712 Hollywood Boulevard). A number of Hollywood streets will be closed this weekend as this neighborhood plays host to the 83rd annual Academy Awards. Please click here for detailed information about street closures. 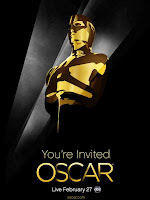 The Academy Awards will be held on Sunday, February 27, at the Kodak Theater in the Hollywood and Highland complex. My office is seeking volunteers who are available this Saturday, February 26, to assist with a Cash for College workshop that we are co-sponsoring with Belmont High School. The workshop will run from 9 a.m. to 2 p.m.
At the workshop, volunteers will help local students access financial aid for college by providing to students and their families one-on-one assistance with completing the federal student financial aid application. State and federal funding to help college students goes unused every year simply because their families can't figure out how to properly complete the complicated FAFSA form. Just a few hours of volunteer work could mean the difference between a student being able to afford college or not. For more information or to sign up to volunteer for a shift, please contact Ryan Carpio at 323-957-4500 or ryan.carpio@lacity.org. As part of Sustainable Silverlake's Sustainable Saturdays program, Sustainability and Zero Waste Consultant Leslie VanKeuren Campbell from Sustain LA will be hosting a workshop to answer questions about recycling and sustainability. The workshop will be held Saturday, March 5, at 11 a.m. at the Silver Lake Public Library. Participants will learn how to maximize their recycling efforts, save money by reducing waste, wisely choose green products and gain insight into the resource recovery industry. Sustain LA leads food service establishments toward sustainable operations by offering techniques to reduce waste, source products and menu items from more sustainable sources, and introduce operational changes to improve efficiency. 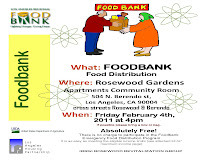 For more information or to RSVP, contact www.sustainablesilverlake.org or call (323) 913-7453. Following City Council action on a motion I authored, the City of Los Angeles is now officially opposed to H.R. 1, a bill in the House of Representatives that would gut critical Los Angeles jobs, senior, transportation, environmental and other services. 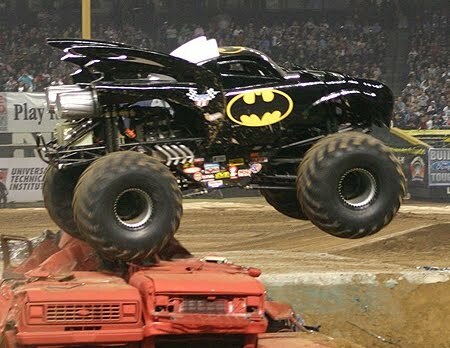 In these tough budget times, government must be smart and strategic about how we use taxpayer dollars. The cuts proposed in H.R. 1 are not prudent because they would result in closed seniors centers, more congested roads, and increased emergency response times. The fiscally-sound and fair course is to invest in services that help put people to work, keep our neighborhoods safe, and revitalize our economy. H.R. 1 simply goes too far. The Frank Lloyd Wright Conservancy in partnership with Hollyhock House and the Los Angeles Department of Cultural Affairs will host a World Heritage event on February 26. The Hollyhock House, one of the crown jewels of Mayan Revival architecture, is under consideration for inclusion on the UNESCO World Heritage List. The event will explain the nomination of Hollyhock and discuss the significance of inscription in the World Heritage List if the nomination is successful. After the discussion, attendees will have a chance to talk with Conservancy board members and City of Los Angeles representatives at a post-lecture reception. There will also be self-guided, docent-stationed tours for participants to enjoy the monumental splendor of Hollyhock House at their own pace. Reservations must be made by Monday, February 21. For a reservation form, click here. 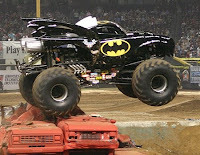 Heads up to those who will be in the area around Dodger Stadium this weekend -- on Saturday, February 19, Dodger Stadium will play host to a monster truck show. The exhibition and racing will begin by 2:00PM and be completed shortly before 10:00PM. This event is expected to be a sell-out and all parking gates used for games will be used for traffic. To minimize the impact on the community a complete complement of LAPD/LADOT officers will be deployed in the community. If you have any questions or require additional information on this event, contact the Los Angeles Dodgers Neighborhood Focus line at (323) 224-2636. 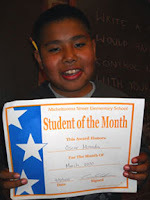 The Smithsonian Latino Center is now accepting applications for the 2011 Young Ambassadors Program. The Young Ambassadors Program is a national, interdisciplinary leadership development program for high school seniors. The mission of the program is to foster the next generation of Latino leaders in the arts, sciences, and humanities via the Smithsonian Institution and its resources. Selected students will travel to Washington, D.C. for a week-long, leadership development seminar at the Smithsonian Institution. Following the training seminar, students participate in a four-week interdisciplinary education internship in museums and other cultural institutions in their local communities, including Smithsonian-affiliated organizations. The program includes meals and accommodations for the duration of the one-week training seminar, round-trip travel costs to Washington, and a program stipend. Participants are responsible for all expenses during the four-week internship, including transportation, accommodations, and meals. Upon completion of the five-week program, participants will receive a $2,000 program stipend toward their higher education. The deadline to apply is Friday, April 8, 2011. Contact Emily Key, Education Programs Manager, at 202-633-1268 or slceducation@si.edu with any questions. Be a part of SurveyLA! Survey LA is coming to Council District 13 neighborhoods and you can be a part of this historic effort. The City of Los Angeles’ Office of Historic Resources will host a SurveyLA Community Meeting on Thursday, February 17, from 7 p.m. to 9 p.m. at the Neutra VDL House (2300 Silver Lake Boulevard). This is the second year of the field survey effort, which includes the communities of Echo Park, Elysian Valley, Silver Lake, and the Westlake District. To RSVP or for more information, please contact Bryan Fahrbach, Outreach Consultant at Historic Resources Group, at bryan@historicla.com or 626-793-2400. 826LA will be holding a fundraiser featuring Conspiracy of Beard, a 20 member a capella group, on Saturday, March 5, at 3:00 p.m.
With a location in Echo Park on Sunset Boulevard, 826LA provides many Council District 13 students with homework help and a place to explore their creativity through the written word. The organization's volunteers and staff provide after-school tutoring, evening and weekend workshops, in-school tutoring, field trips, help for English language learners, and assistance with student publications. The event will be held at the Echoplex (1154 Glendale Boulevard), and a donation of $10 for adults and $5 for children is suggested. On Saturday, March 19, from 6:00 to 9:00 p.m. Homeboy Industries will host the opening reception for their new art project, Exit Wounds. Exit Wounds is a collaborative project between former gang-involved youth and Los Angeles artist Nancy Baker Cahill. The exhibits tell the stories of each participant through photographs, original art, text and unconventional objects. The opening reception will be held at the Hi-Lite Project Space (533 South Los Angeles Street). Works will be on sale with 100 percent of the proceeds benefiting Homebody Industries. The exhibit will also be available for public viewing on March 22, 29, and April 5 from 10:30 a.m. to 1:30 p.m. or by appointment by calling 213-784-2003. To see examples of the art click here. 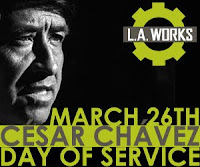 Celebrate the life of César Chávez with LAWorks as it hosts the César Chávez Day of Service in Echo Park on March 26. 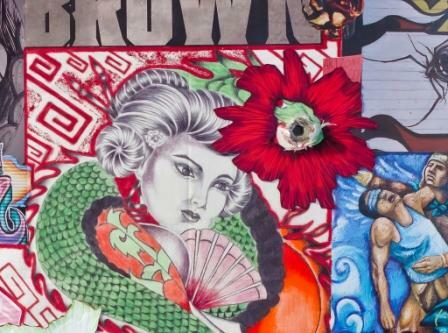 Volunteers will work with and mentor Los Angeles Unified School District students as they create murals with community justice and human rights themes. Once completed, these murals, painted on canvas, will be donated to schools and libraries in Los Angeles and displayed for the enrichment of the greater L.A. community. Painting will take place from 9:00 a.m. to 1:00 p.m. at a location to be determined. Click here to help become a sponsor or click here create a volunteer login. After years of work to abate the nuisance property at 3304 Drew Street, the City of Los Angeles has acquired it and will be transforming this neighborhood problem into a community garden specifically for neighborhood residents. The new community garden will be a place where local residents can work along side their friends and neighbors and grow fruits and vegetables for themselves and their families. 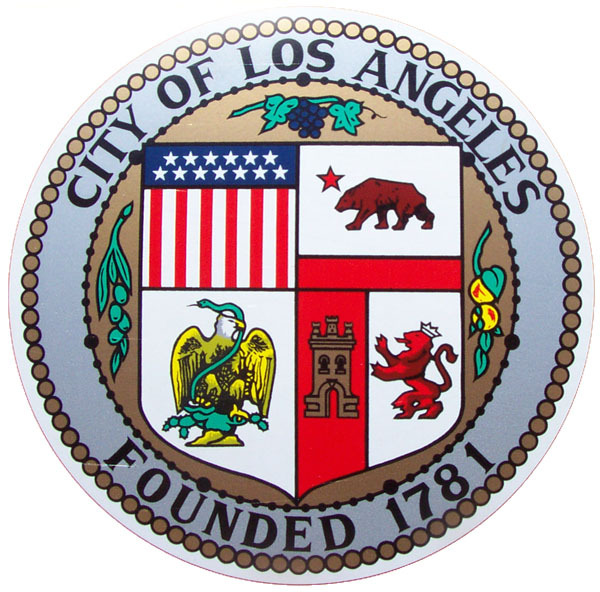 The City is partnering with the Los Angeles Community Garden Council to manage the garden. There will be an informational meeting on Thursday, February 17, 6:00 p.m. at the Glassell Park Community/Senior Center (3750 Verdugo Road). Please call the Glassell Park satellite office at 323-478-9002 with any questions. The Echo Park Lake bird team will host the Great Backyard Bird Count at Echo Park Lake on Sunday, February 20. The inventory of local birds will begin at 8 a.m. at the Echo Park Lake Boathouse and will help conservationists protect the area's native wildlife. For more information, contact Judy Raskin at judycalifornia@yahoo.com or call (323) 663-6767.
the Specialty Spay Neuter Center (5026 W. Jefferson Blvd.). Neutering for cats will be available for $10 by appointment. Low cost vaccines and microchips for dogs and cats will also be available. For more information or to make an appointment, call 323-730-5303. 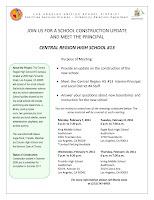 The Los Angeles Unified School District is hosting a series of meetings to update the community on the progress of the new Central Region High School #13. On Thursday, February 10, there will be a meeting held in the Irving Middle School Auditorium (3010 Estara Ave.) from 6 p.m. to 7:30 p.m. Participants will hear an update on the school's construction and have the opportunity to meet the Central Region HS #13 Interim-Principal and Local District #4 staff. Construction of Central Region High School #13 is scheduled for completion this summer. 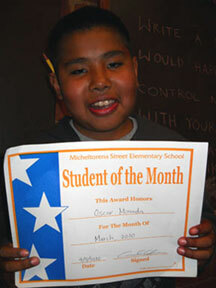 For more information, please call Maria Cano at (213) 241-6493. I was saddened to learn of the passing of Jack Popejoy over the weekend. Jack was not only a journalist, but an engaged civic leader who took seriously his job of informing Angelenos. 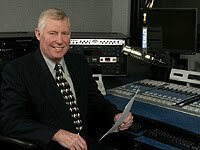 Although he was widely known for his work at KNX and KFWB, Jack was also the host of Council Week in Review on the City of Los Angeles's cable TV station and worked closely with our city’s Fire Department. He will be missed by those of us who worked with him at the city and by people across the Southland. 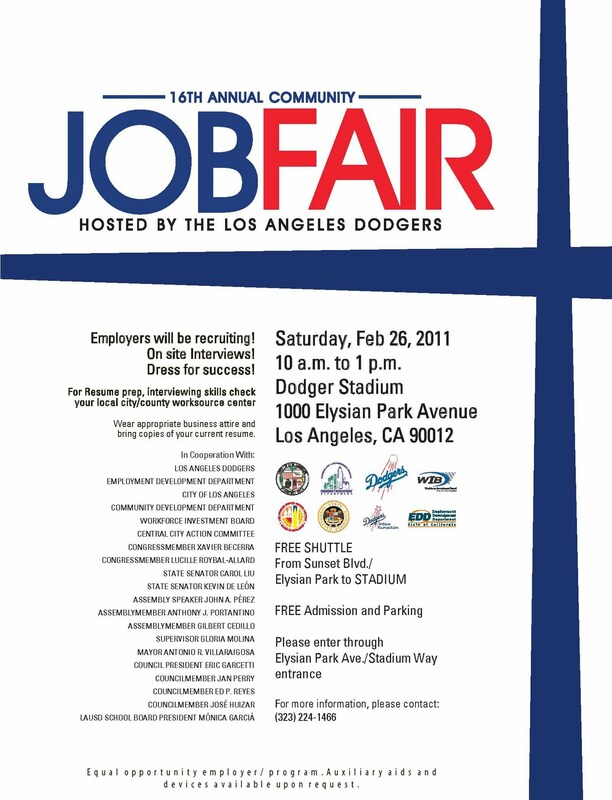 The Los Angeles Dodgers will be hosting the 16th Annual Community Job Fair on Saturday, February 26, from 10 a.m. to 1 p.m. at Dodger Stadium (1000 Elysian Park Ave.). 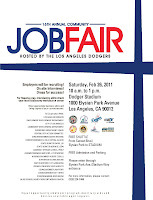 Employers will be recruiting and conducting on site interviews. Participants should wear business attire and bring copies of their current resume. Admission and parking is free. Enter through Elysian Park Ave./Stadium Way entrance. There will be a free shuttle from Sunset Blvd./Elysian Park to the Stadium. The second annual 4-Mile Hill Challenge Run and Kids 1K Trail Run to benefit the Audubon Center at Debs Park will be held on March 12. The course will take place on the trails of Debs Park's 280-acre urban wilderness and will finish at the Audubon's state of the art nature center. 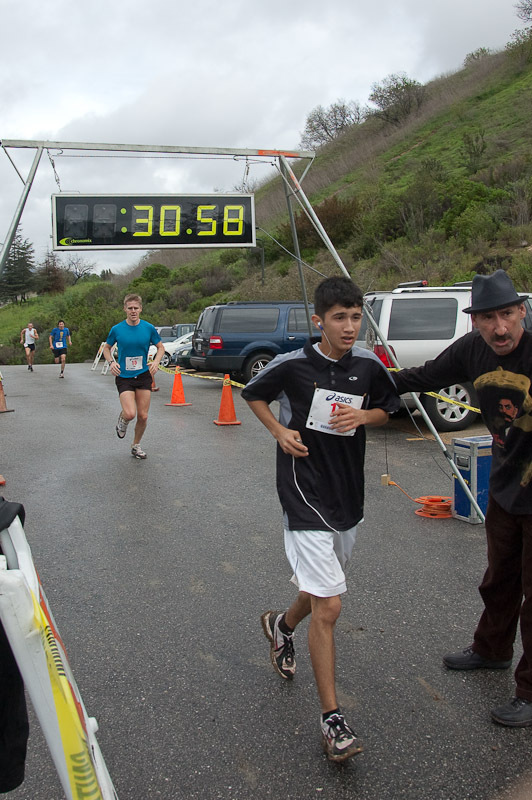 The 4-Mile Hill Challenge will offer a post-race party with music and snacks as well as a health fair, petting zoo and other community service booths. There will be childcare provided for kids ages 4+ as well as access to the Audubon Center's outdoor learning area for kids. In addition, every participant will receive a goody bag and a commemorative t-shirt. The race start schedule is as follows: 8:45am start for men, 9:20am start for women, and 10:00am start for kids. Registration is available online or by mail. Early registration costs $25 for adults and $15 for kids 12 under (thru Feb. 12). Late Registration costs $30 for adults and $15 for kids 12 under (Feb.13-Mar. 11). Day of Registration costs $35 for adults and $15 for kids 12 under (6am to 8am, March 12). This event is being organized by Aztlan Athletics and Str8Up Tv. Children's Hospital of Los Angeles is offering free substance abuse prevention and treatment services. Services include screening and assessment, prevention education (individual and group counseling), treatment (individual, family, and group therapy), AOD free activities for youth, and training for parents, teachers, and community providers. Services are available at the CHLA location at 5000 Sunset Blvd., Suite 540, (in the Citibank Building on the corner of Sunset & Alexandria). Hours of operation are Monday through Thursday from 8 a.m. to 7 p.m. and Friday from 8 a.m. to 4 p.m.
To make an appointment, call (323) 361-2463. For an initial screening/assessment, walk-in hours are Tuesdays from 9 a.m. until 1 a.m. No appointment is necessary for walk-in hours. The City of Los Angeles is conducting community forums as part of its effort to reform the City's Development Review Process. Community members are encouraged to attend and provide input on what improvements are needed in moving forward. This month, Just Hollywood kicks off Just Food, a free gardening education program designed for students ages 14 to 18 years old. The program teaches students how to grow their own food while providing leadership training and an opportunity for students to start a garden in their community. Classes are offered twice a week (M/W or T/Th) from 3 – 5 p.m. A cooking class and community meal will be offered on Fridays. The last day to register for winter classes is February 15. Winter classes begin February 21 and run until May 27. On Sunday, February 27 from 3-5 p.m. there will be a ribbon cutting ceremony to celebrate the start of the program. For more information or to register please contact Corrine Galavan at corrinemgalvan@gmail.com or 310.425.6651 or Nathan French at nathan.justhollywood@gmail.com or 323.636.1535. The Los Angeles Department of Water and Power will host an Energy and Water Conservation Workshop for business customers on February 10 at 10 a.m. The workshop will be located at the John Ferraro Building (111 North Hope Street) in Downtown Los Angeles. The workshop will provide information about energy and water conservation programs designed to help save money while helping the environment. The workshop will also provide an opportunity for business customers to provide feedback on existing LADWP programs and offer suggestions for future programs. Parking is available free of charge in the Music Center’s underground structure. Attendees should enter on Grand Avenue, between Temple and First Streets, look for the LADWP representative at the entrance and present a printed copy of the invitation. To RSVP for Energy and Water Conservation for Business workshop, click here. 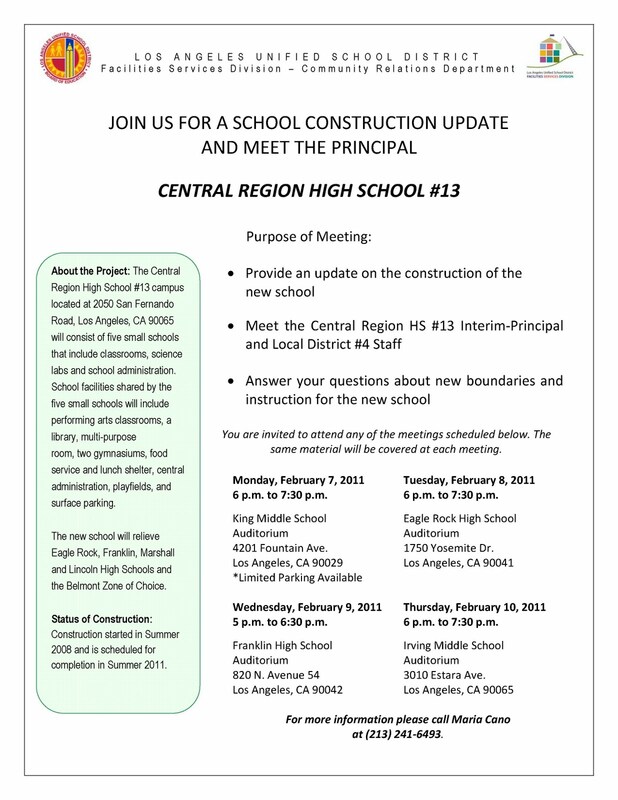 Beginning next week, LAUSD will hold several public meetings to discuss the progress being made on Central Region High School #13, which will be located at 2050 San Fernando Road and consist of five small schools. The new school will help relieve Eagle Rock, Franklin, Marshall and Lincoln High Schools and the Belmont Zone of Choice. The first meeting will take place Monday, February 7, from 6 p.m. to 7:30 p.m. at King Middle School Auditorium (4201 Fountain Avenue). For a complete list of meetings, please click on the flyer on the right. Found Animals is sponsoring a weekend of free spay and neuter clinics for low income pet owners. On February 19 and 20, pet owners can request a free surgery online or by calling 1-800-SPAY-4-LA and following the message instructions. 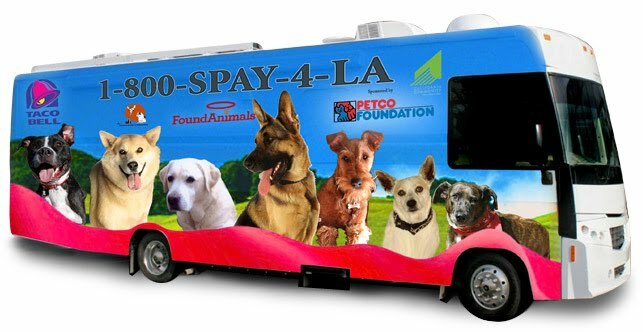 Surgeries will be taking place at all three Clinico locations (Pico Rivera, San Pedro, and Van Nuys) as well as the Spay4LA mobile unit in South LA. The Los Angeles Regional Foodbank Emergency Food Distribution Program will be distributing food to families in need at the Rosewood Gardens Apartments (504 N. Berendo St. ) community room on Friday, February 4, at 4 p.m.
Partners in this program include the United States Department of Agriculture, Los Angeles Housing Partnership, and Rosewood Revitalization Group. The Society of St. Vincent de Paul, Council of Los Angeles (SVDPLA) is hosting a "Hike for the Homeless" fundraiser at Griffith Park on April 2 from 8:15 a.m. to 11:30 a.m. This event will help raise funds for the Society's homeless shelter, Cardinal Manning Center, which has served homeless people on Skid Row for more than 50 years. Participants will have the choice to hike a 2.64 mile hike or an easier 2 mile hike. The hike registration fee is $25. There is also a student rate of $15. Registration includes a t-shirt and refreshments. For more information about the "Hike for the Homeless", please contact the Cardinal Manning Center at (213) 229-9963. You can also register for the hike online at hike4thehomeless.com.